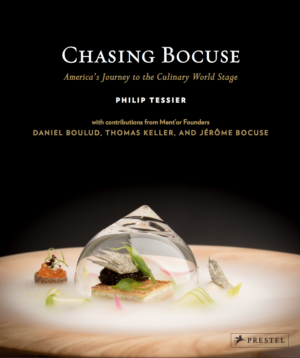 Chasing Bocuse: America’s Journey to the Culinary World Stage is a behind-the-scenes look at Team USA throughout every stage of training for the Bocuse d’Or, from the darkest struggles to the greatest triumphs. With excerpts from the 2015 and 2017 teams, coaches and supporters, our story is told from numerous vantage points of how America’s best chefs united in the pursuit of gold at this storied competition. These pages are filled with 200 stunning photographs and nearly 40 recipes from each of the coaches and advisors that supported the teams over the past four years. This entry was posted on September 26, 2017 by Young Yun.